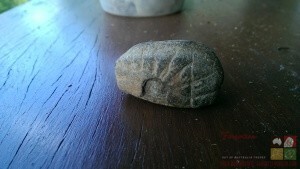 A gentleman whom we will call an amateur archaeologist, at his request, made contact with us quite recently with tales of an unusual marked rock, some talk of a metal bowl found at a place claimed by some to be centre of an ancient Phoenician settlement and a variety of other interesting artefacts. However, without a photograph to view all I had were words and good intentions laced with degrees of maybe. Not long after we made a personal visit and met the amateur archaeologist and his rocks, along with one rather intriguing, and initially under-appreciated metal bowl, was not the disappointment expected, but the opposite. So too a marked rock that could bear evidence of artificial markings carried better prospects than expected, but having not seen the smaller marked rock my interest was always on hold and until the unveiling, as much as the bowl was far more important than predicted, I was still distracted. Initially to those not briefed in the intricacies, this rock may seem to be slightly underwhelming, quite worn and by comparison to Ros’ Rocks 1 and 2, hardly deserving of more than a quick glance. But once in possession of Frederic Slater’s notes, and in particular his ten diagrams of the most holy concepts/words, this small marked rock grows in stature and importance ten times over. All symbols in the sacred list are circles with an increasing number of lines radiating out of the top half of the circle, beginning with one and concluding with the most sacred and versatile symbol containing nine lines. As does this small fine-grained metamorphic rock, a circle was obviously engraved and has since fallen out, but the nine rays, even though quite worn, can be counted and identified. Measuring 5 cms by 3 cms we are of the belief that the stone was cut in half and we suspect the other hypothetical half will also carry an engraved symbol of equal importance. It seems that the vertical 4 centimetre engraved line on the right-hand side of the rock was chiseled into the rock first. The three rays that intersect appear to go over the top of the underlying line, what that means is of course unknown. That same line leads to the back side, and there seem to be two possible lines, but so worn is this side that outside suggesting there is a good chance the narrative continues on the flip-side, nothing else can be stated with confidence. The actual sacred word it represents cannot be given in any public arena or off-site, but the meanings are intriguing, especially since this is the only one of these symbols that has multiple base meanings. Under the right circumstances and contextual background it can mean “the guide to truth,” which is our preference, or “the guide to the soul brought in with the unity of life,” with another option being “one of the first forms of the cross.” Whatever selection is appropriate it is one of the most sacred symbols in this language. The greatest difficulty we always face when translating this ancient tongue is that as Karno Walker advised us, most symbols and arrangements can have up to four meanings. In what only adds to the difficulties in this case there is, as Karno warned us, a fourth option that has credentials. Another equally blessed symbol which Slater deliberately sets apart from all other categories in his simple ‘dictionary’ is also a circle with nine rays stretching out from the top half. The only difference to “guide to truth” is that this circle has five inner pecks. We do not know whether these pecks were originally here, but it is tempting to postulate that the five pecks may have weakened the structural integrity of that circular section, so much so it fell out neatly leaving no jagged edges or bumps. Whether “the talking head/I speak for all,” is applicable can never be decided, but either way the rock bears an extremely important marking that means so much on the Standing Stones site. 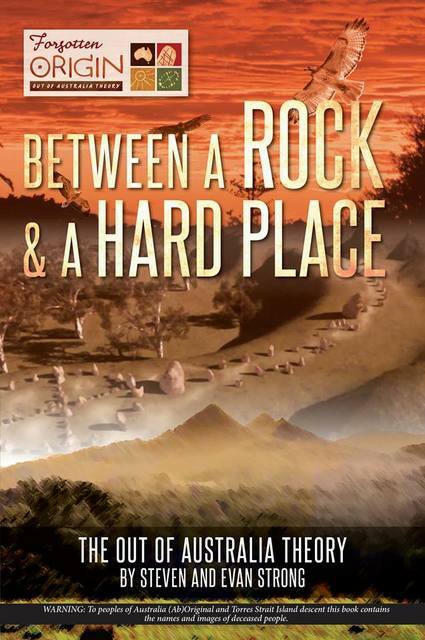 Knowing that this rock was found within 10 kilometres of the Standing Stones site, this is either powerful confirmation of Slater’s claim that these sacred mounds and what was placed above and within is no less than the equal of Stonehenge, or an incredibly rare coincidence. The reality is that this marked rock completes the set of four types of symbols, arrangements and markings on rocks as described by Slater over 75 years ago. Less than two months ago the second of Ros’ Rocks was first seen and investigated, but what initially drew our interest was the suggestion that the letter A was engraved on one side. And so it was, the first vowel of the English alphabet also happens to be the first letter in the Original alphabet. It is undeniable that the English language is an ever-changing hybrid that is hundreds of years old, while the Original language is tens of thousands of years old, therefore deciding which language used the letter A first is a simple, but decidedly uncomfortable, matter. If anything the letter A takes on greater significance and volume when used in the Original First Language, simply because as Slater observed, the “language is built almost entirely on vowels.”(Slater, Personal Notes). And, as noted in our introduction, the discovery of the rock with an engraved letter A, supplemented by the quite recent addition of the nine-armed sun symbol, completes Slater’s list. Shaped and marked rocks we have in abundance, and all were found on the site or close by, complimenting this Karno has stood on site and shared some of the hand signals and how to ‘read’ the shaped rocks. Put all of this together and we now have the complete itinerary as itemised by Frederic Slater, and what is also present and accounted for is the total verification of his findings as to what this site meant. 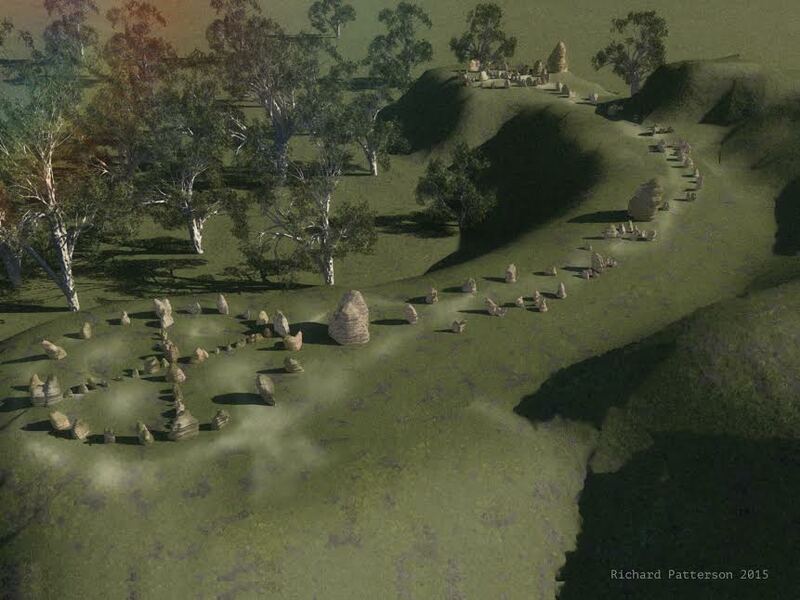 Slater’s only error in translation was his gross underestimation of the antiquity and intricacies of this site, when claiming it to be “Australia’s Stonehenge.” Far from just chronicling the summer solstice and positions of the sun and moon, as is the case at the Stonehenge site in England, Slater himself adds so much more to the list of achievements of the Australian constructions. 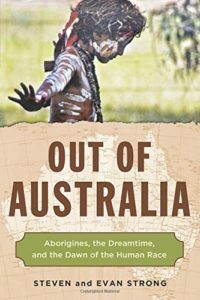 He found that the Original “philosophy was evolved in the beginning of time,”(Slater, Personal Notes) and that all other languages and forms of numeracy are not unique “but just aboriginal (sic).” (Slater, Personal Notes). Stonehenge marks out the transit of the sun and moon, and that is about the full scope of the functions performed. But no-one anywhere else has ever made claims like Slater when declaring that the language preserved in stone at the Australian site “formulates the basis of all knowledge in the beginning, now and to come.” (Slater, Personal Notes) That proclamation, offered by one of the top academics on Original and ancient Egyptian language in the country, was not made by us, we are just picking up his baton. His stature and depth of knowledge in Original matters was unchallenged at the time by his academic colleagues, however, in these times many academics of lesser awareness of these matters refuse to look, read or discuss his work or correspondence. 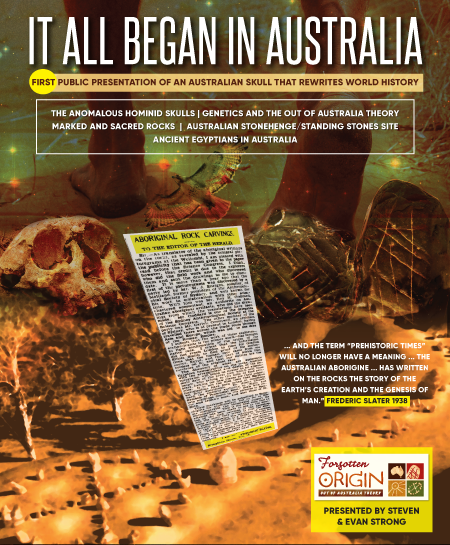 We have his original notes, have been on site four times and heard confirmation from a variety of Elders and Custodians of the Old Way validating everything Australia’s top academic on these matters declared as fact. Despite all the scientific rigour and observance of Original protocol we have presented in papers, articles and books not one institution or department has bothered to respond, acknowledge or discuss. They are missing in inaction and fear of the unknown, and if they choose to ignore the nine-armed sun and letter A, their shame is manifest as they abandon the truth in preference to a posting, grant or currying favour with those who no longer care for the truth or consequence. Nevertheless, as before we still extend the same open invitation to view, inspect, measure and photograph without interference (a luxury we were never extended). 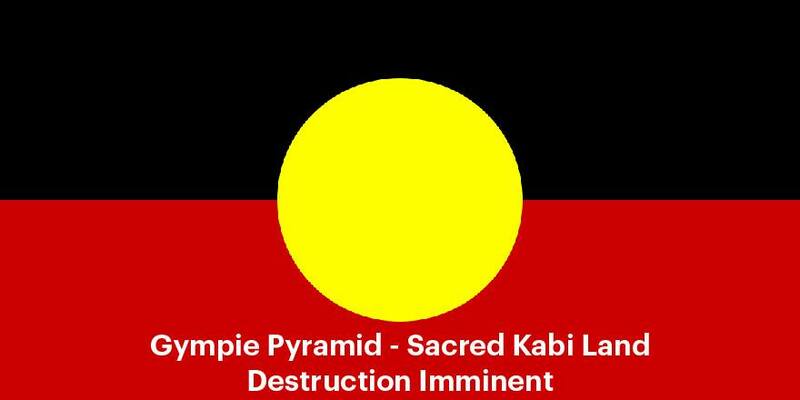 Aware that this climate of denial in relation to any archaeology we are associated with is ensconced in Australian academic circles, we have no doubt the second artefact we were shown will also experience the same wall of inertia and discomfort. As acknowledged earlier, the initial talk of a metal bowl did not stir much interest. That soon changed, the bowl was far more interesting than expected. 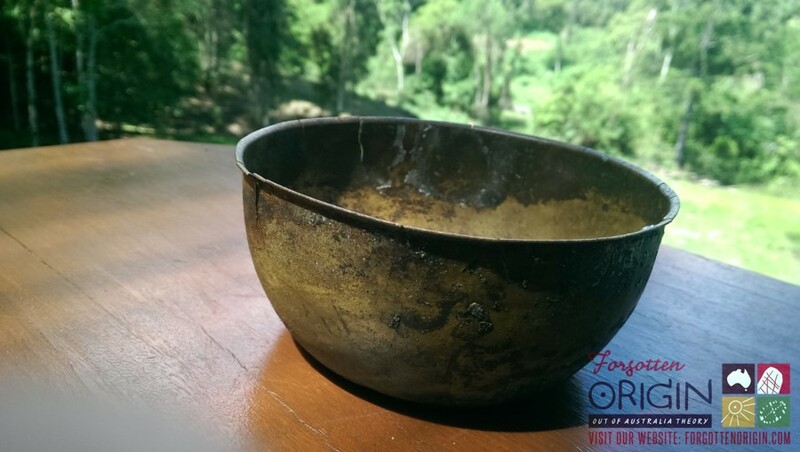 The bowl is obviously old and not made from iron or tin, but is most probably copper with a second choice of bronze. We are not metallurgists and prefer to have a back-up, but even so since it was heavily coated in green when found before cleaned, and still retains a green tinge, we feel copper is the most likely metal. That alone presents a problem, as from the time of invasion onwards iron ore and coal have been the preferred raw materials, manufacturing anything out of copper or brass was not a high priority. The use of copper and bronze fell away dramatically once iron ore was used to make steel, the other metals being of an inferior strength and resilience were discarded and only used in more specialist areas. The upper diameter is 14.5 cms while the bottom of the bowl has a diameter of 9.5 cms with a lipped edge of consistent width running along the top edge. There is some fine vertical cracking running along the lip, even though there are over a dozen small splits emerging, the structural integrity of the bowl is still strong. That alone is intriguing as is the width of metal is very fine and carries hints of designs which again suggests that this artefact is quite old. Where this artefact does become more enticing is when factoring the location of recovery. From the first time Sarina was mentioned my interest was aroused, as this place is well known for the talk and rumours of all manner of Phoenician remains which have been claimed to be found. 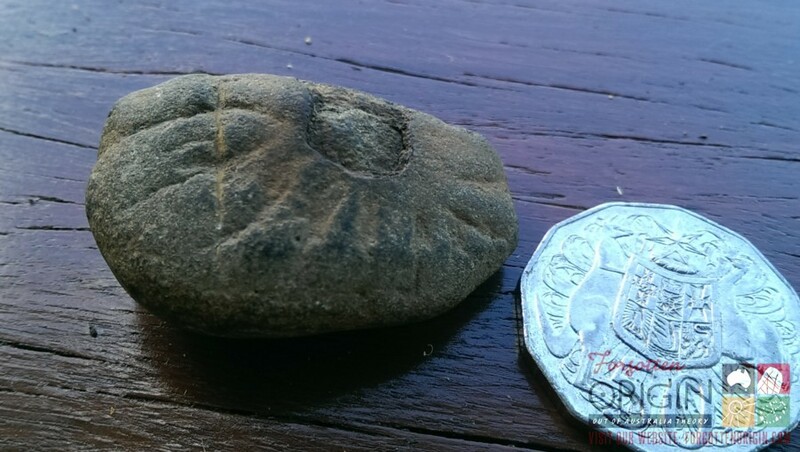 Researcher Val Osborne has spent a great deal of time investigating the area and is adamant that this area was the focal point of all Phoenician settlements in Australia. If for no other reason than the fact the bowl is not made from iron ore and was found in the Sarina region it deserves further investigation and interest. Of course, this ancient bowl although most possibly genuine is of secondary interest, the small rock with the nine rays radiating out of the missing circle (with or without five pecks) is of major significance. Slater was right, the first Language spoken is Original and the first place this ancient tongue was memorialised through rock is the Standing Stones site. Unlike us, he is an academic of the highest order and one of their own. Slater did the research and we have the supporting archaeology that proves he was right, isn’t that enough to satisfy their rules? If not, what more do they require?